MAGNUM Single Phase MaK-1 DIRECT ON-LINE MOTOR STARTER is a powerful controlling device for your motor/pump made with heavy duty components, which switches and protects your device from hazards caused due to over-current. Magnum Single Phase Direct On-Line Motor Starters are reliable "Workhorses" for domestic, agricultural and industrial applications. Motor Starters are also found in many applications such as drainage, sewage pumping, general industrial pumping and slurry pumping. Rugged MaK-1/MaCH Contactor with wide voltage band is designed for exceptional endurance. 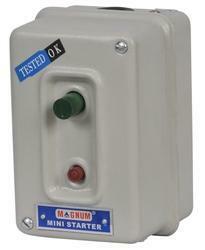 MAGNUM Single Phase MaF-1 DIRECT ON-LINE MOTOR STARTER is a powerful controlling device for your motor/pump made with heavy duty components, which switches and protects your device from hazards caused due to over-current. Rugged MaF-1 Contactor with wide voltage band is designed for exceptional endurance. 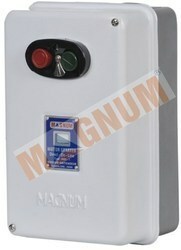 Fitted with MaF-1 type relay for reliable overload protection.